The garden suite is a perfect romantic destination, ideal for a honeymoon or romantic anniversary weekend. Tastefully decorated with Persian rugs, original artwork and antiques. The king size bed boasts an ultra comfortable mattress with luxurious linens. A large armoire and walk in closet provides ample storage. The large living area offers a comfortable sofa, chairs, a 40' flat screen TV, DVD player and a dining table with 4 chairs. The bathroom is large and has a designer walk in shower with multiple shower heads and body washes. Designer eat-in kitchen with stainless steel appliances, microwave and granite countertops. Kitchen is fully equipped with designer dinnerware, cooking utensils, wine glasses and champagne flutes. Complimentary coffee, creamer & bottled water provided. Located in one of the most prestigious homes in the landmark historic district directly on Forsyth. Built in 1870 for the city Treasurer John Williamson, the home is located directly on Forsyth Park next door to the Magnolia Hall Inn owned by the Savannah College of Art and Design and only steps away from the famed Forsyth Park fountain. Many shops, restaurants and cultural destinations are a short walk away. 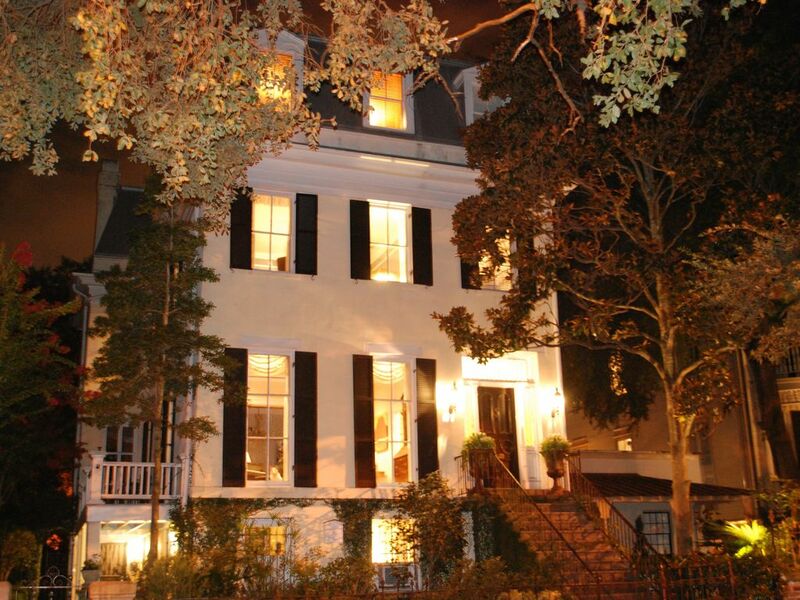 This is the ideal location for your visit to Savannah. Parking is conveniently located right around the corner on Huntingdon Street. The home is owned by Mr. Brett Turner and Dr. Kimberly Turner. Originally from Florida, Mr. Turner has been a real estate developer for the last 17 years living in the Savannah area for the last 12 years. Dr. Turner, a Periodontist, is originally from Hartford Connecticut and opened her medical practice in Savannah in 2007. Both of the Turners are very active, love to travel and are avid triathletes. Please contact Deborah Schott, the Turner's property manager, for any inquiries or questions about our property. Prime location directly on Forsyth Park in the heart of the historic district, walk to many wonderful restaurants and shops. Large luxurious bath with double vanity, walk in closet, large walk in shower with multiple rain heads. A great location. City park across the street. Free trolley in front of house. Kroger store 3 blocks away. Very walkable area. We walked to river. Comfortable, romantic, quiet, great location and free parking. Will definitely return here! The garden suite by far exceeded our expectations! When we arrived we couldn't believe how beautiful the suite was, the lights & tv were already on....was very welcoming. It was very accommodating & comfortable. Decorated so beautifully. The bed was amazingly comfortable & the linens were so soft. The bathroom was amazing, stocked with soft towels & oh my goodness that shower!! The kitchen had all the neccesities & complementary kcups for the Keurig. And the location couldn't have been more perfect, overlooking Forsyth Park, peaceful & quiet! We absolutely enjoyed our long weekend in Savannah and we hated to leave the beautiful garden suite! The owners take great care of their property & their guests! Would definitely recommend & would definitely come back! We loved this suite. It was perfect for my husband and I on our anniversary trip. It was a beautiful home and a great location. Wonderful, charming, cozy suite on Forsyth Park! We came to Savannah for our 15th Anniversary. We really enjoyed our stay in the Garden Suite! It was beautiful, comfortable and cozy! The location is excellent! Deborah was a great help with any questions we had. We would recommend staying here!